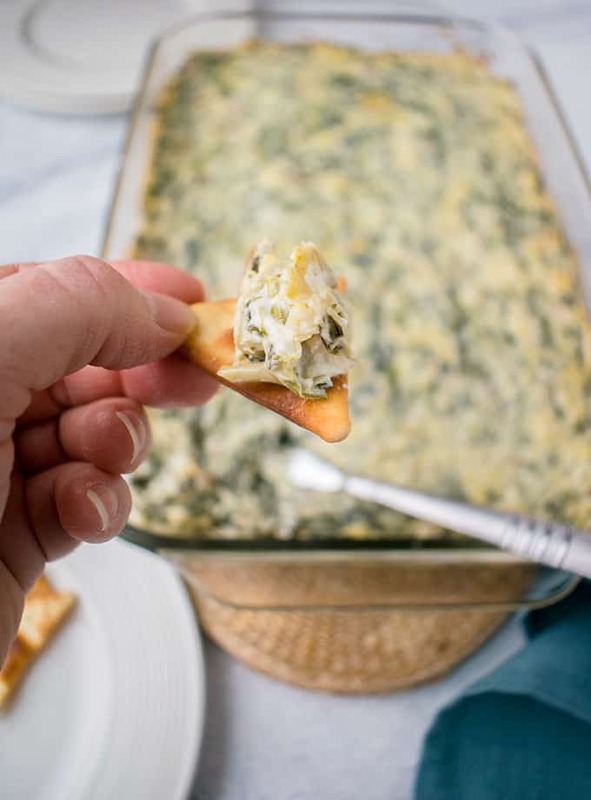 You need this Asiago Spinach and Artichoke Dip in your life! It’s a creamy, cheesy hot dip with chunks of artichokes, sautéed red onions and a touch of spicy heat. When dips are really good, they have a way of becoming the meal’s centerpiece. 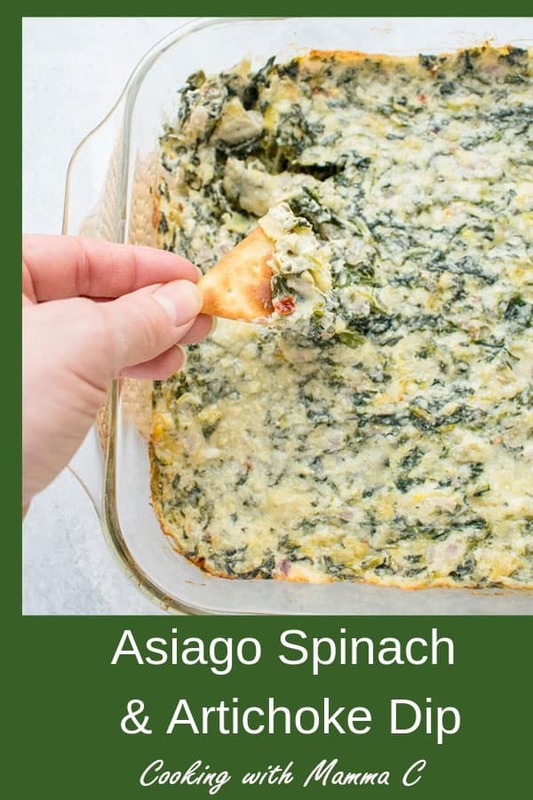 That certainly happens whenever I make this Asiago Spinach and Artichoke Dip. No matter what else is at the table or on the buffet, people will park themselves in front of this appetizer and declare they’re happy to nosh on it all night. And Lord knows, I’ve made an entire meal of this on more than one occasion, with the excuse of adjusting the recipe until it’s just right. 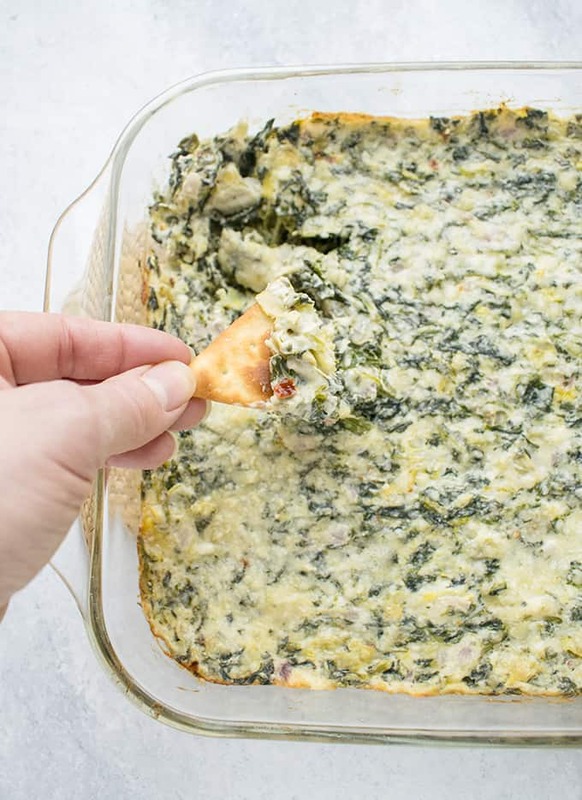 You may have noticed there are tons of spinach-artichoke dip recipes out there. So what’s different about this one? 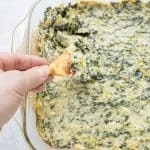 First, just as in my Creamed Spinach Soufflé with Artichokes, this dip utilizes frozen artichoke hearts (that’s an affiliate link for a case of 12.) They’re the closest things to fresh artichoke hearts. If you’re an artichoke lover, like I am, you’ve got to ditch those soggy jarred ones and see what you’ve been missing! Second, the cheese here plays a big part in the taste. There are three kinds in this dip — cream cheese, Asiago and Parmesan — with Asiago lending the strongest flavor. No, this isn’t a skinny recipe, but I do use light cream cheese and 2% milk to counter the richness from the cream in the cheese sauce. At least there are lots of veggies, right? Third, (and fourth), there’s nice onion flavor, thanks to the red onions, and some heat, thanks to the red pepper flakes. I’ll never be one to eat food that makes my eyes water. But I’m finding, the older I get, the more I appreciate a little spicy kick in my food. You can adjust the heat to suit your tastes, but I’ve found this level is just enough to be noticeable without turning anyone off. 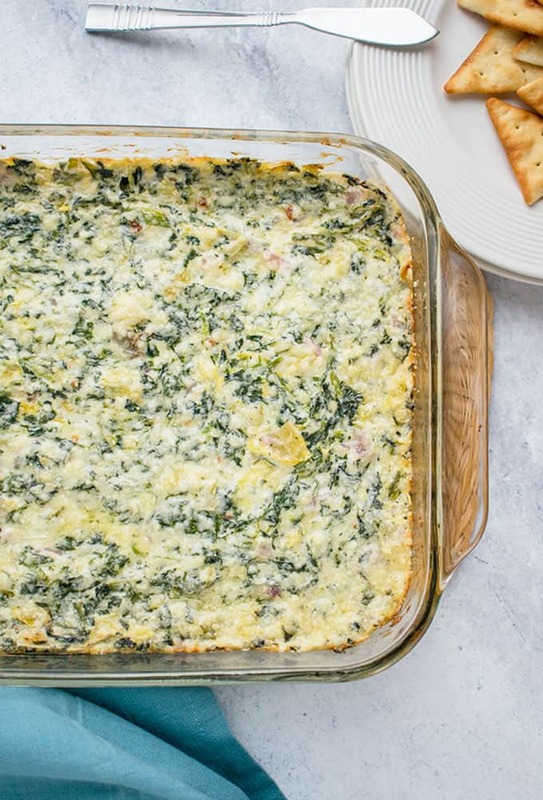 Can Spinach and Artichoke Dip Be Made Ahead of Time? Yes! You can assemble the dip a couple days ahead, then bake it the day you serve it. 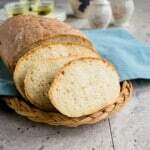 You can even bake it ahead of time and then reheat it the day you serve it. 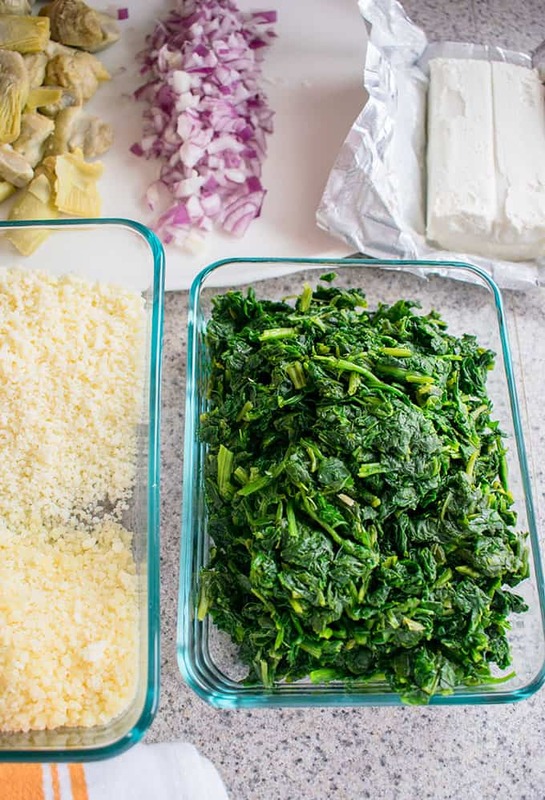 Can You Freeze Spinach and Artichoke Dip? I just froze a portion of the baked dip last night and reheated it in the microwave today. After stuffing my face – I mean conducting research – I can say, it’s still AWESOME!! 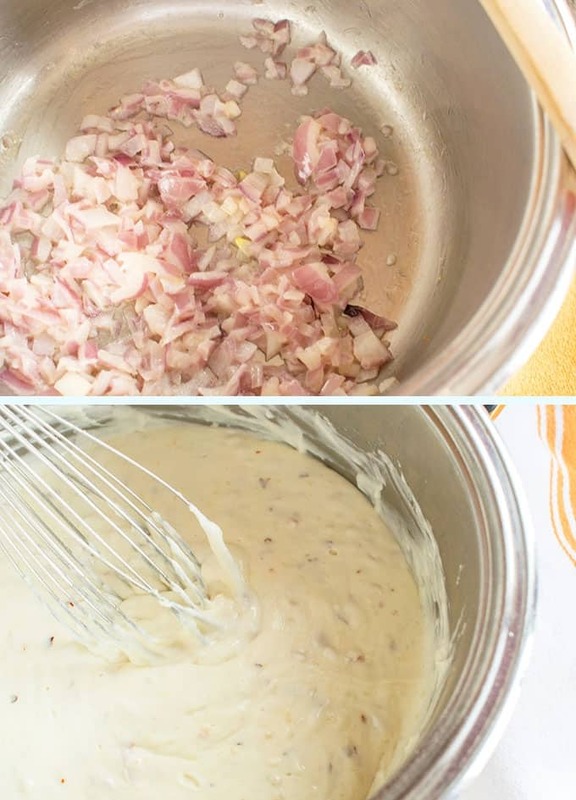 A creamy, cheesy hot dip with chunks of artichokes, nice onion and Asiago flavors, and a touch of spicy heat. 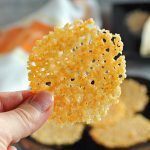 Serve with pita crackers, natural tortilla chips, carrot sticks or bread. While the spinach is in the microwave, peel and chop 1/4 of a large red onion. 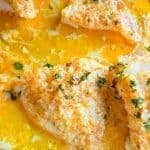 Grate your cheeses in a blender or food processor. When the spinach is thawed, drain out the liquid in the sink by grabbing small handfuls of spinach and squeezing them over a strainer. Set your dried spinach in a large mixing bowl. Thaw your artichoke hearts in the microwave, again fitting the contents in a large glass pan, if you have one, and heating on high for 4-5 minutes. When the artichokes are thawed, drain any liquid and roughly chop them, leaving some chunks. Pat them dry with a paper towel and add them to your large mixing bowl. In a sauce pan, melt your butter over medium-high heat. Add the chopped onions and cook them until they are just becoming tender. Add the flour and stir to mix. Continue stirring for another minute. Add your whipping cream and milk, stirring (or whisking) as you go. Continue stirring, and when the mixture thickens, add your block of cream cheese. Continue stirring, until the cream cheese melts and the sauce is smooth and thick. Turn off the heat and stir in the Asiago, 1/2 cup Parmesan, red pepper flakes, salt and garlic powder. Pour the sauce over the vegetables in your large mixing bowl and mix well. Transfer the dip to a greased 9x13 pan (or use two pie dishes or crocks). Spread the dip evenly and top with the remaining 1/4 cup Parmesan. Bake the dip for 20-25 minutes, or until the dip is bubbly and browned to your liking. Serve with pita crackers, natural tortilla chips, carrot sticks, or bread. Store leftovers covered in the refrigerator for up to four days. You also can freeze the leftovers and reheat them in the oven or microwave. 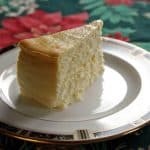 You can use 12 ounces of evaporated whole milk in place of the whipping cream and low-fat milk. You can assemble the dip a couple days ahead, then bake it the day you serve it. You can even bake it ahead of time and then reheat it the day you serve it. 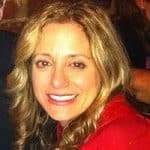 Hi Karly – Thank you! It’s so addictive!